In a hard hitting statement, the President said anyone who wished to leave could, provided their release clauses were met. Merten is rumoured to have caught the eye of Manchester United and Tottenham, with both clubs monitoring the situation. The two clubs are looking to sign the attacker, who has scored 21 goals in Serie A this season. He has replaced Gonzalo Higuain at the top of Napoli’s attack quite efficiently. But this fairytale may come to an end soon. His family is allegedly not settled well in Naples, and might be a reason he leaves the club. Laurentiis had said the 29-year old can leave, along with centre-back Kalidou Koulibaly. 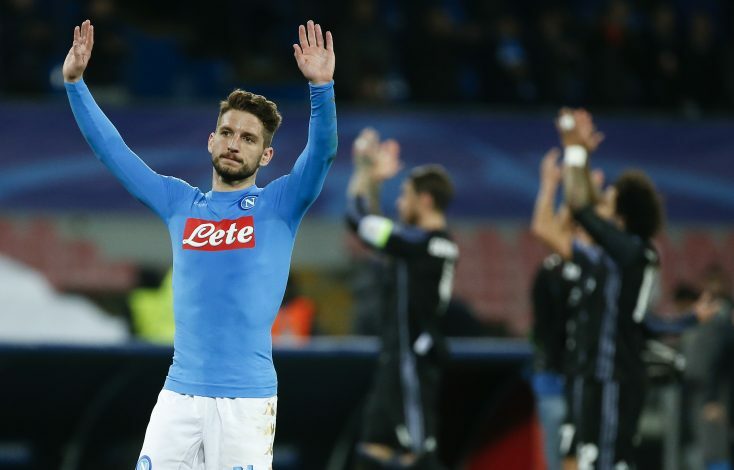 “Mertens has a family situation that you all know, he has not clarified [his future] 100 per cent, and we are waiting to see what happens,” De Laurentiis said on Saturday at a press conference to announce Lorenzo Insigne’s contract renewal. “Funnily enough, the calls he’s getting are due to all the goals he scored thanks to Maurizio Sarri. With a different coach or team-mates, he probably wouldn’t score so many. “This is why I say that in football you need immense humility. There’s nothing guaranteed. People ask me what happens if Chelsea make another offer for Kalidou Koulibaly? Our defence would be no weaker without him, because there are alternatives. We leave nothing to chance. “I don’t want anyone to leave and so will try to keep hold of them, but if they want to leave or some crazy person comes along offering to pay the release clause, then we’ll get over it, just as we did in the past,” he added. Mertens çontract expires in 2018 and is seems likely he won’t renew it. “You have to love the city of Naples, or you can leave,” De Laurentiis said. “Naples is not like living in Turin or Manchester. Tweet to get in touch with Rvk.